Phew!!! It is almost over! I have been blogging twice a day for the whole of World Alzheimer’s Month / Dementia Awareness Month, #DAM2015, and am feeling vaguely jaded… I wonder why?! To say it has been a slog, is an understatement, and I have not been that well either, so it has definitely taken its toll. In fact, it is quite likely I will be quiet for at least a few days, as I have some very important things on my ‘To do list’, and also need to get well to do them. But, to end this month of awareness raising, I wanted to end with a personal high. I am proud to report that I was the winner of the Bethanie Education Medallion award, runner-up in the University of Wollongong, 2015 Alumni Award, Social Impact Category, the winner of the University of Wollongong, Community Engagement Award, a finalist in the Dignity Australia Achievement Award for Outstanding Contribution by an individual, and I found last night out on twitter, a finalist in the Dementia Services Development Centre University of Stirling International Dementia Awards 2015, Dementia Leader of the Year, and I am a finalist in a reasonably prestigious award I am not yet able to announce. I do not do any of the things that I do for awards, but it is a delight to be recognised. I work only to improve the lives of people with dementia, of which very selfishly, I have a vested interest! My dear husband believes perhaps that I have been cloned, as I operate in a number of time zones, sometimes getting up for meetings as early as 2.30am and as late as midnight. 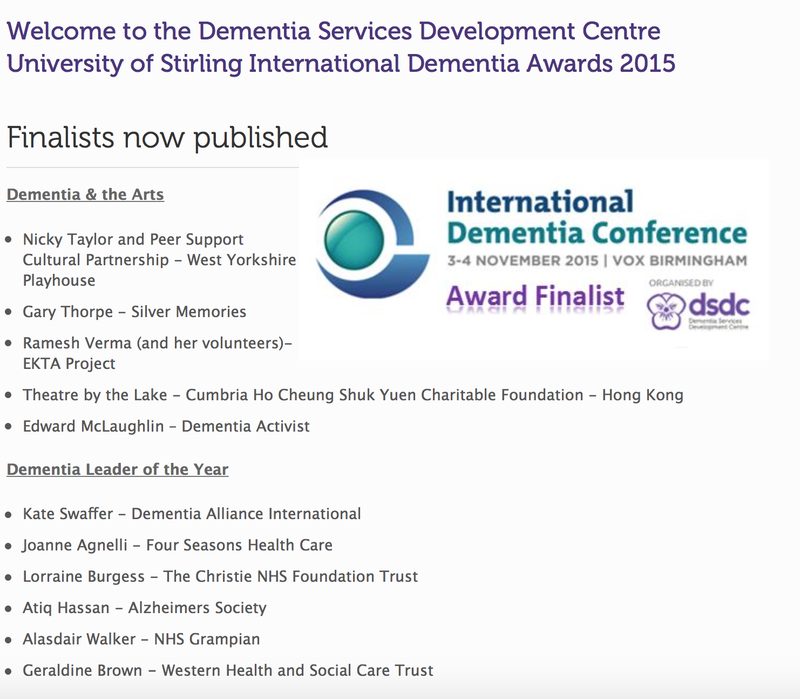 It is impossible to be the Chair of an international support group of, by and for people with dementia, without doing this, especially as we are collaborating with so many other organisations, an members, in so may time zones, and striving to offer some very unique services and support to people with dementia all around the world. 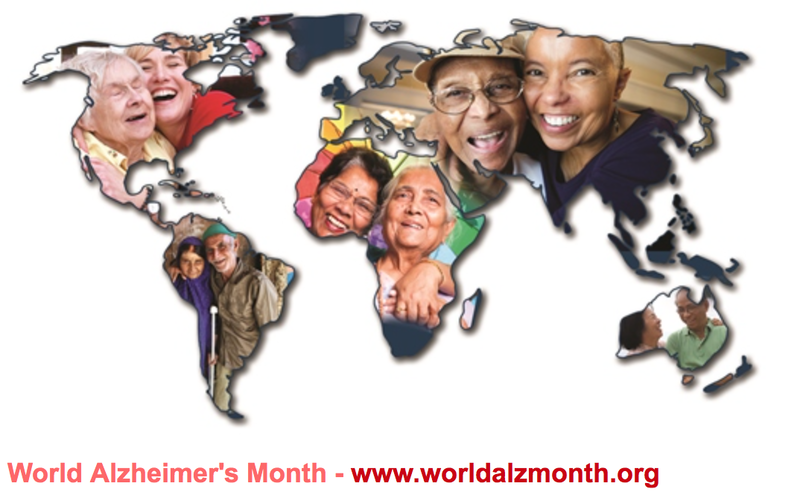 So, in conclusion to this last World Alzheimer’s Month, I really hope it has made a difference, but until the issues such as respectful language are properly addressed, and the voices of people with demote are accepted without such a ruckus from carers, and some acceptance from that grass-roots level, I very much doubt it has. Awareness, at any cost, is not necessarily helpful. you are brilliant, kate – keep going!! All those awards and all the work you have been doing this month on your blog in addition to all else = Kate needing some time out and a nice rest up! Please do take care Kate, and know that PWD here in the USA are happy to have you on our side! Those that see through to your heart award you everyday! Well Done Kate, You are an inspiration. Kate, you are an inspiration to me, and when working with people who have dementia, I can make a difference to there lives. Thank you. Thank you Kate for your daily blogs. Don’t know how I’ll cope if you don’t continue to post every day. Congratulations. Two blogs a day is no easy task. You have, do, and will continue to make a huge difference to so many of us who have, or love someone with Dementia/Alzheimer’s. Thank you so much for helping to open our eyes just a little larger! Rest up a bit now, doll. I’ve got my “oldie but a goodie” Wonderwoman T- shirt ready for you! Rest, revive and take care of you. You are much loved and respected. Thanks Wendy… I am exhausted, and looking forward to a few days!! Thanks Julia, I will look out for that… those of us (PWD) who speak out never mean to demonise family care partners, we simply want the other side of the story told, and our feelings and needs are generally quite different to what many think they are, including those very close to us. Well done Kate. Now for a well deserved rest. Take care.